You have a sector-by-sector backup of LVM formatted drive made with Acronis Backup & Recovery 10. You boot another machine using Acronis bootable media from Acronis Backup 11.5 or Acronis Backup & Recovery 11 and start the recover of image. When click on Reboot, the machine reboots, and the recovery task finishes, but nothing is restored. This issue occurs, when the target machine has LVM volumes. Linux bootable media activates them in order to allow restoring over them. 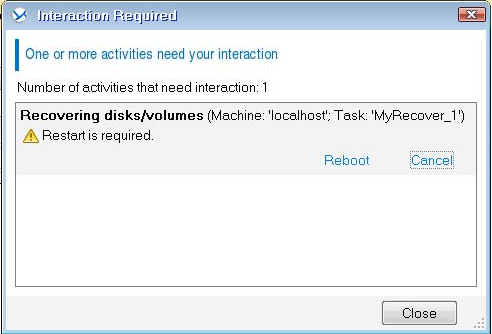 However, if you restore disk or partition image over underlying physical partitions the program may ask you for reboot. If reboot asked after real data restore it is OK to do, reboot and check restore results. However, if you have asked for reboot before real data restore and after reboot you are asked for it again, you should cleanup destination disks by changing representation style: Tools > Windows representation mode. After, you can do restore in Linux representation mode. The issue does not occur if you are restoring to drives without LVM.